Item description: * See scan - perfect condition. Extremely rare medal. "FOR NIT OCH REDLIGHED" SILVER ISSUE is a medal awarded to people that had at least 20 years of perfect service to the Royal Swedish Crown and State. This is a King Gustav V issue and only a handfull of people were awarded with such an award and each medal bears the name of the person awarded. The name is not inscribed but it was minted with the name!!! 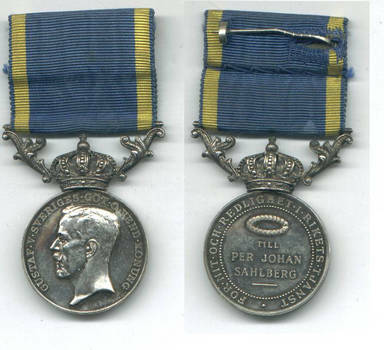 The name on this medal is PER JOHAN SALBERG. Medal is made out of solid STERLING SILVER and probably weighs about 25 or more grams. Extremely rare and scarce item.